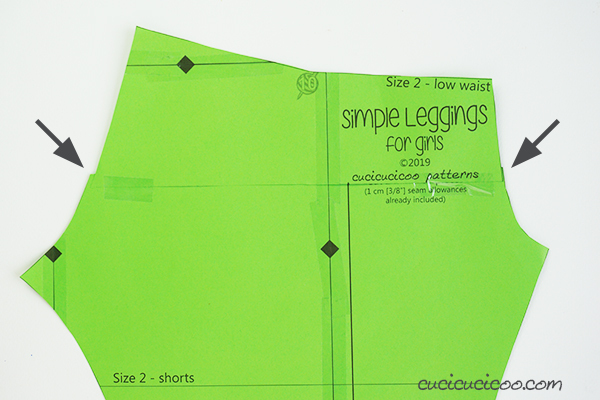 Over the past couple of months I’ve been working on a series of leggings patterns for girls and women (you can find them in the Cucicucicoo Patterns shop!). An interesting thing about pattern testing clothing is seeing how differently a pattern can fit different body shapes. The same pattern might be tight for one lady in the same point where it is loose for another. 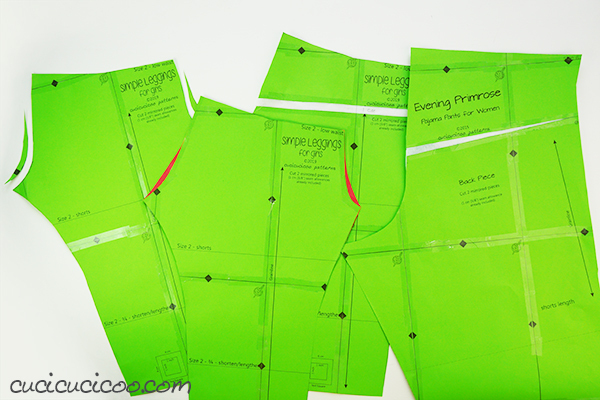 Luckily, there are lots of ways to modify a pattern for a perfect fit, but today we’ll cover how to adjust the crotch in pants in the four most important and useful methods. 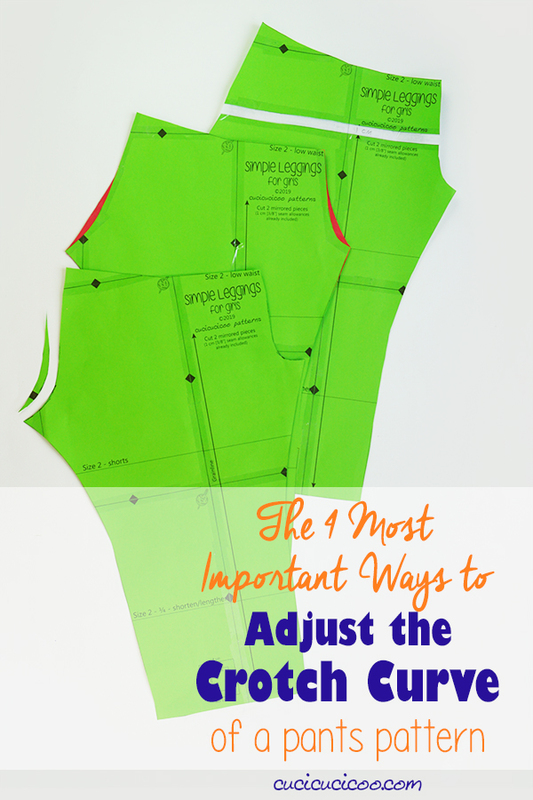 I’ll show you how to adjust the rise and the curve in the crotch, which can drastically influence how your garment fits and help make it flatter your body shape. Let’s get started! 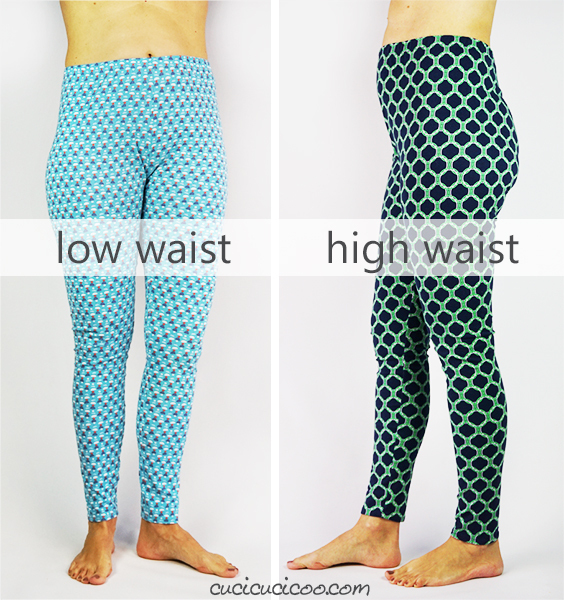 This was an image showing the original low and high waist options for my Simple Leggings for Women pattern. Except it was definitely too high for both options, so I lowered it all around for the final pattern. In this case we have to lower the rise of the pattern on both the front and back. 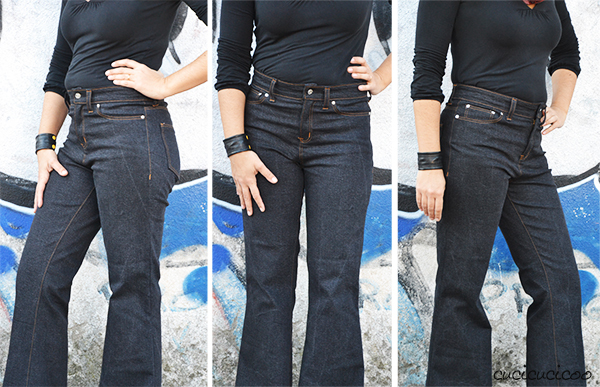 The rise is the length of the curve between the crotch point and the top waist of the pattern. When the rise is too high, it pulls up too high on the waist and/or the fabric slips down both in the front crotch and the bum in the back, making unsightly sags. 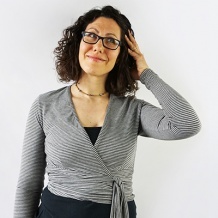 You can make this adjustment on either a one-piece pants pattern, like my Simple Leggings, or a two-piece pants pattern, such as my Evening Primrose PJ pants. 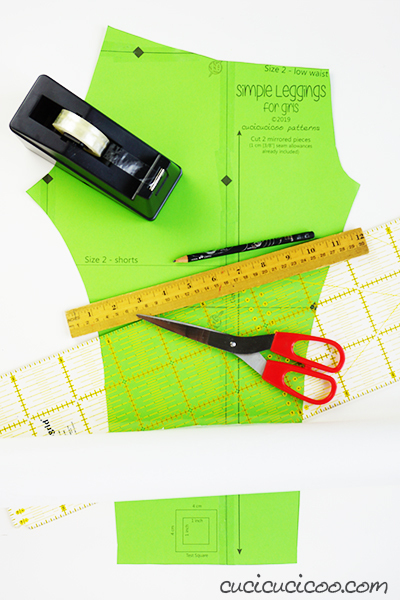 If you are making this adjustment on a two-piece pattern, make sure you modify both pieces in the same way or else the sides won’t align. 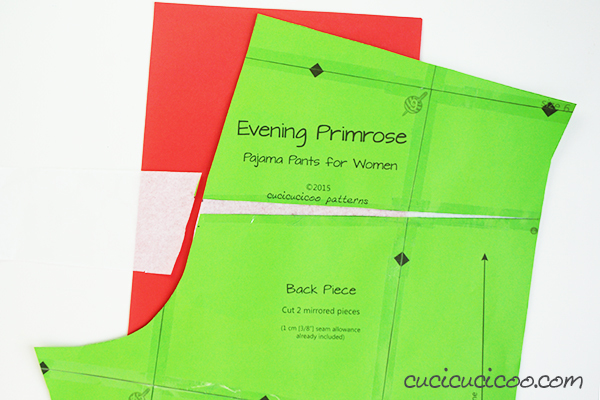 Draw a line across the pattern above the main crotch curve. To make sure it’s perfectly horizontal, I always line up a marking on the quilting ruler with the grainline arrow on the pattern. Then cut straight across along the line. 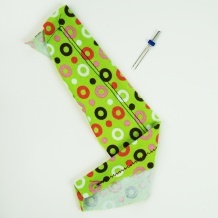 You can pinch the fabric of your sewn pants while wearing them to see about how much you need to remove from the pattern. Then mark that amount below the cut on the lower pattern piece. For my example, I’m removing 1 cm, so I made a couple of marks 1 cm below the cut. Then slide the top piece down so that the bottom edge hits the marks you’ve just made. Make sure that the grainline arrow or other markings in the center of the pattern are lined up, then tape the pattern in place. There will be bits of the pattern edges sticking out, so just smooth out the curves by trimming it with your scissors (not shown). Let’s say we have the opposite problem: the rise is too low in the front and the back. If this is the case, the garment’s waist will not reach all the way up to your body’s waist, so we need to add to the pattern. Match up the top line to the bottom edge of the top piece, matching the vertical line with the pattern’s grainline (or other perfectly vertical) marking, as shown by the arrow above, and tape it in place. Then match up the top edge of the bottom piece with the bottom line, again matching the vertical lines, and tape that in place. 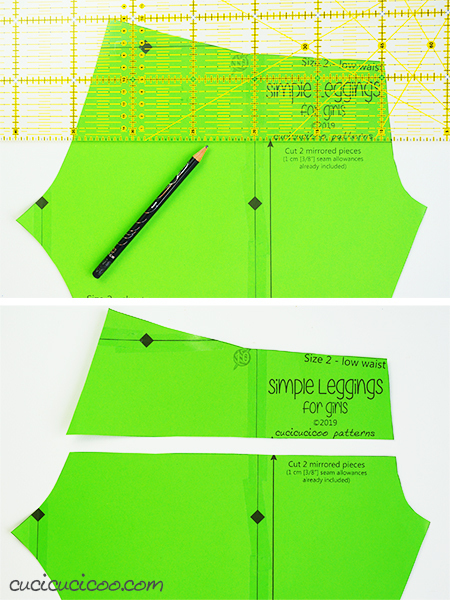 Trim both layers of the pattern to make even curves, and you’re done! The bottom picture here has red paper underneath to better show the new curved edges. Now, let’s imagine that the back of your pants fits perfectly, but the front rise is too high. This was the case with my Birkin Flares. As you can see above, the jeans covered my bum and arrived perfectly to my waist in the back. On the front, however, the fabric sagged down terribly at the crotch. When I pulled them up higher, the fabric straightened out. This meant that the rise was too high ONLY in the front. It is also possible for the rise to be too high or low only in the back, too. The adjustments to be made are the same. 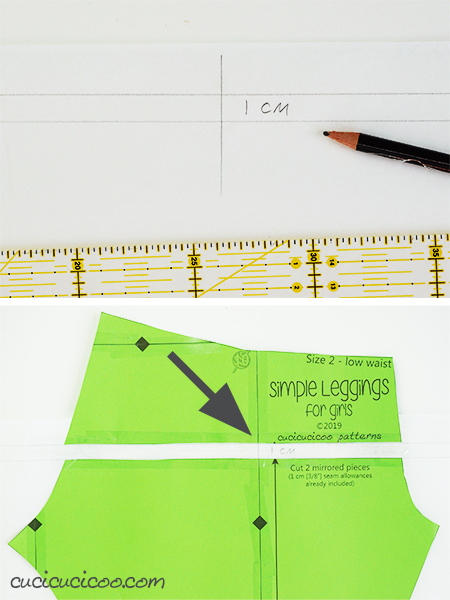 To adjust the rise ONLY in the front or the back, you must have a pants pattern in two pieces. So here I am using my Evening Primrose PJ pants. 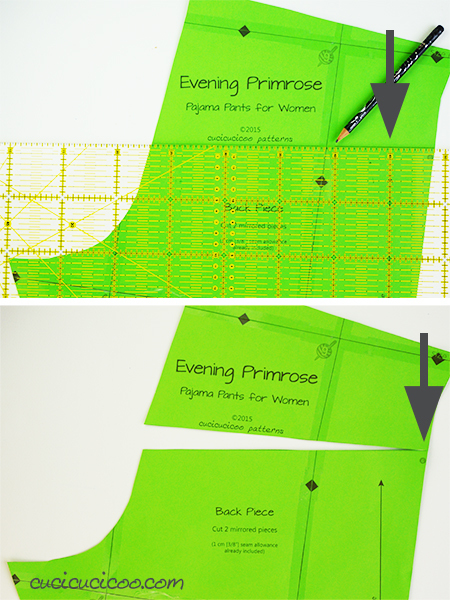 Draw a line across the front (or back) pattern piece as shown before. 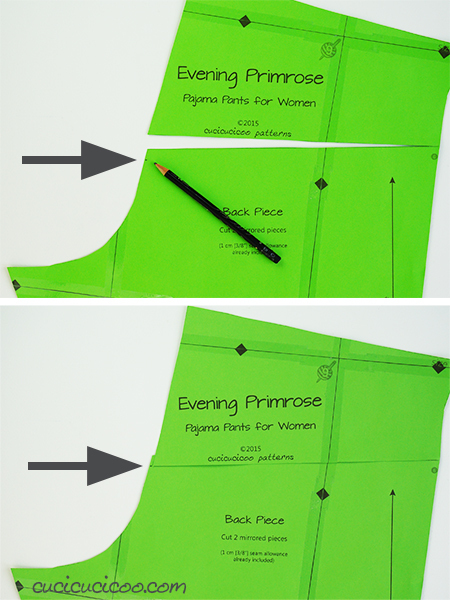 Remember to line up the ruler with the grainline arrow (shown by the arrow in the top picture). This is even more important with two-piece pants patterns because neither side is perfectly vertical. Cut along this line, leaving only a tiny bit intact at the side so that the two parts can separate with the side as a hinge. Then mark the amount that needs to be removed (again, I’m doing 1 cm) below the cut along the crotch curve (shown by the arrow in the bottom picture). Lower the top part so that the open edge hits the mark made below the cut (shown by the arrow in the top picture). Then tape the pieces together. 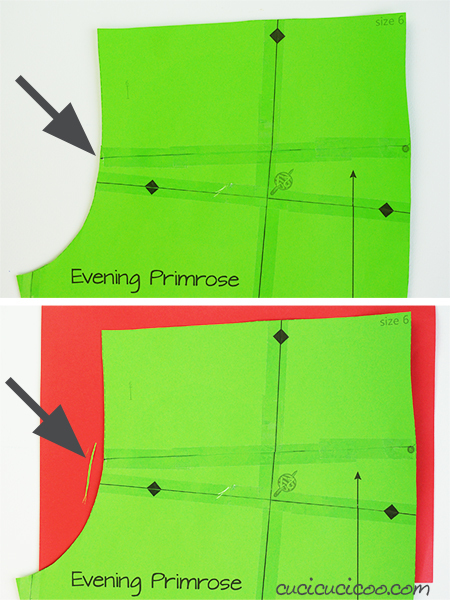 Trim off the pattern to smooth the curve out (shown by the arrow in the bottom picture). Now let’s imagine that the front fits perfectly, but your back waist is too low, putting you at risk for showing off your bum when you bend or move. In this case, we need to raise the back rise only. Start in the same way as lowering the back or front rise. 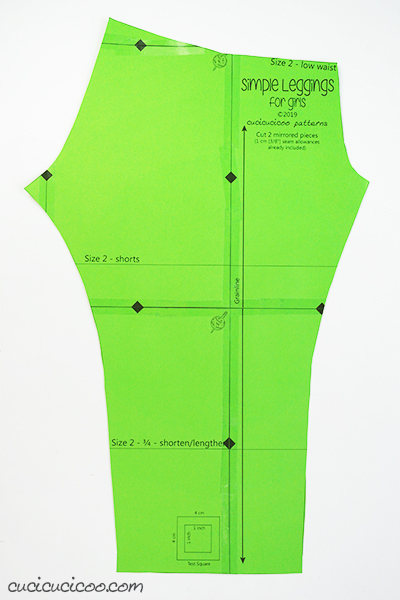 Draw a line across the back (or front) pattern piece as before. 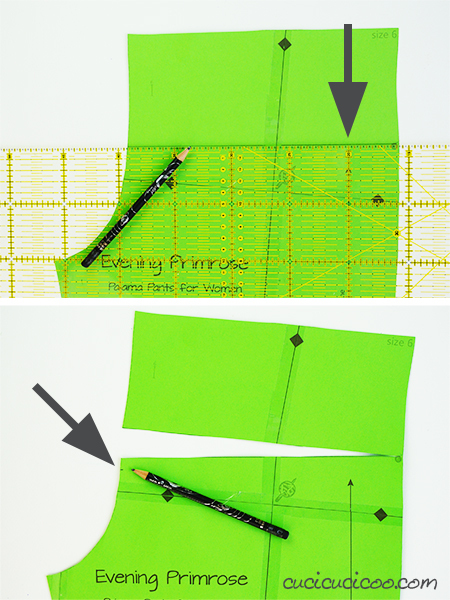 Remember to line up the ruler with the grainline arrow (shown by the arrow in the top picture). Cut along this line, leaving only a tiny bit intact at the side so that the two parts can separate with the side as a hinge (shown by the arrow in the bottom picture). 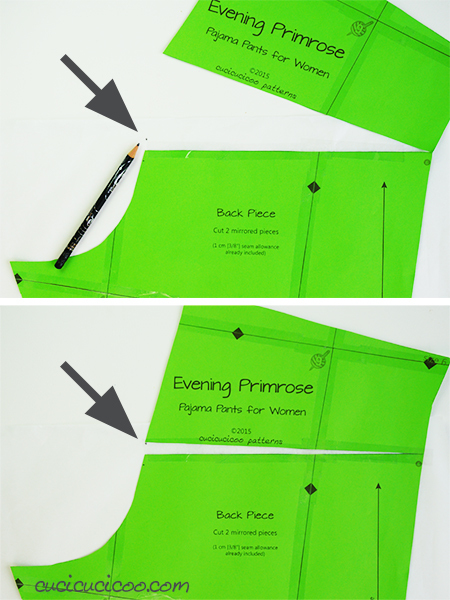 Put a piece of pattern drafting paper under the pattern and tape the edge of the bottom part to it. Then make a mark 1 cm (or the amount you need to raise it by) above the open side of this piece (shown by the arrow in the top picture). Pull the top piece down so that the tip hits the mark (shown by the arrow in the bottom picture), and tape in place. Trim the curve to even it out. 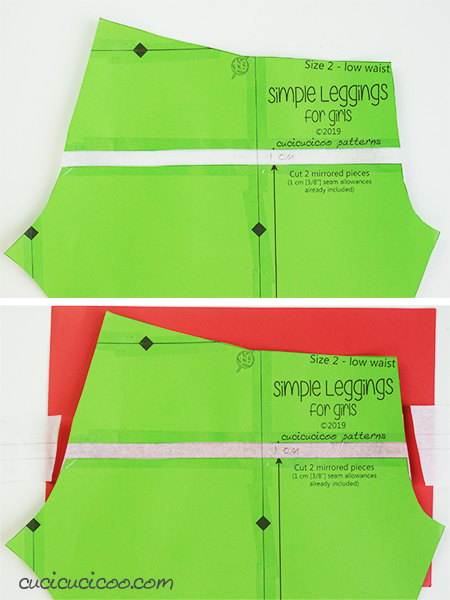 Remember that you can make both of these adjustments for either the front or the back of you pants. Here I’m showing how to lower the rise on the back only. Click below to continue reading about adjustments to the crotch curve itself. Trust me, these are super important!